The 25.3 metre motor yacht Giddyap, listed for sale by Peter Hopwood at Allied Marine, has been sold with Chris Collins at Ocean Independence introducing the buyer. Built in GRP by Italian yard Ferretti to a design by Zuccon International Project, Giddyap was delivered in 2005 as a Ferretti 830 model and fully refitted in 2016. Accommodation is for eight guests in a master suite, VIP suite and two twin cabins, all with entertainment centres, LCD television screens and en-suite bathroom facilities. In addition, there are quarters for three crew. Her large saloon has comfortable seating on leather sofas, an entertainment centre including a 46-inch retractable LED television screen and stereo surround sound system plus a separate dining area with seating for eight guests. On the flybridge there is a large al fresco dining area with a U-shaped table, wet bar, barbecue grill area, hot tub and fridge, all shaded by a hard top. Other key features include the bow area, which incorporates a generous sunbathing area and seating along with a sun umbrella, ideal for total privacy at sea or in port, while the garage at the stern, below the large cockpit, opens to provide a large swim platform. 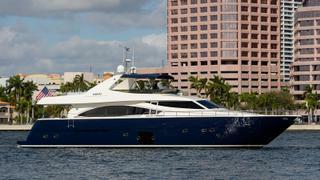 Twin 2,000hp MTU diesel engines (new in 2011) give her a cruising speed of 40 knots topping out at 45 knots. Giddyyap was asking $2,150,000 and will join the Ocean Independence charter fleet under her new name Dee Dee Lee.